Various news sources have been keeping us steeped in rumors for some time now, but Microsoft spoiled all the fun today. Although we've known Halo 4 has been on the way, we now have an official date of release. November 6, which is Election Day in the U.S., marks the launch date for the fourth installment of the popular gaming franchise. In addition to finally receiving a solid date, Conan O'Brian will feature a special segment on his late-night show dedicated to celebrating the game's imminent release. His show, Conan, can be seen on TBS at 11:00pm tonight. 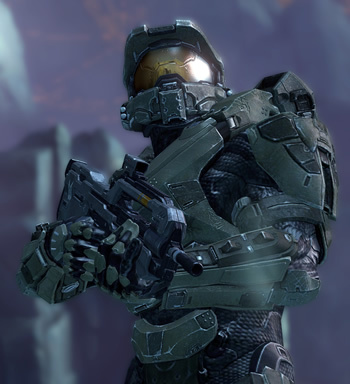 Although still highly-anticipated, Halo 4 will be the first Halo release to not be developed by Bungie. The game studio had concluded its vision of the trilogy in 2007, but left some unanswered questions regarding Master Chief and his sidekick. After Bungie became an independent game studio and emancipated itself from Microsoft, 343 Industries (or 343i) picked up the torch with plans to create another Halo trilogy. Although Microsoft hasn't been particularly forthcoming with details on the next installment, Game Informer was able to dig up some juicy nuggets earlier this month. According to the magazine, Master Chief is expected to make a return and the story line will pick up in the year 2557, four years after the finale of Halo 3. In addition to many changes like a newly designed HUD and a more "cinematic feel", players can expect a special cooperative play mode with periodically released, downloadable episodes that expand upon the Spartan storyline. Multiplayer is also expected to feature custom load-outs, equipment modifications and other nifty changes. PC enthusiasts may be disappointed to hear that Microsoft only mentions an Xbox launch in their press release. Of course, Halo 3 never quite made it to PC either, despite a healthy helping of rumors over the years.